William Hague has come under increasing pressure in the last few weeks, criticised for a series of blunders over Libya, Egypt and the whole Middle East, culminating in the disastrous SAS mission. William Hague has come under increasing pressure in the last few weeks, criticised for a series of blunders over Libya, Egypt and the whole Middle East, culminating in the disastrous SAS mission, which further unravelled yesterday, The Sunday Times reporting (£) that rebels had accessed secret MoD computer codes on “scraps of paper” captured from operatives on the bungled operation, described by one expert as “so inept, it is unbelievable”. • Why was he so slow to grasp and show any support at all for the Middle East / North African democratic revolutions? Even Cameron got there quicker, showing sympathy for the Egyptian protesters and antipathy toward Mubarak, even while Hague was still virtually parroting the Israeli line of support for Mubarak. • How can Hague justify having visited the autocracy of Bahrain to assure them of British support at the very time when the widely predicted (and then brutally suppressed) Bahrain democracy protests were getting underway? See here and here. 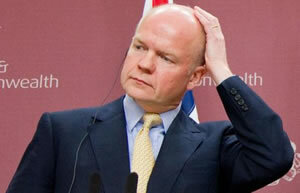 • What is Hague’s explanation for his bizarre and jejune outburst about Gaddafi’s allegedly having fled to Venezuela? Was it any more than an opportunistic attempt to smear Chavez? • Why didn’t Hague oversee a more effective operation to evacuate British civilians from Libya? Surely someone must carry the can for this? • Why did Hague send the SAS into free Libya, rather than simply phoning up the revolutionary forces’ HQ in Benghazi to establish good diplomatic relations with them? Craig Murray’s hypothesis is a particularly worrying one. • Why has Hague, unlike Cameron, been so slow to support the free Libyan forces? Why has he not pressed for most of the measures advocated by Carne Ross to be implemented by Britain and the EU, and why has he not enthusiastically backed Cameron’s call for a No-Fly Zone to help save the Libyan revolution? Labour is of course in a poor position to attack Hague over Libya, for reasons I document here; as a Green, thankfully, I am not. But, crucially, it is not even just over issues of foreign policy that Hague is now in trouble. As I pointed out recently over at Open Democracy, Hague has been spreading untruths about the BNP and AV, too. It would be extremely unwise (to put it mildly) of the prime minister to repeat these untruths, as I point out here. He would be better off in fact distancing himself from the completely unsound Tory BNP-AV canard which Hague has promoted, for sooner or later he will surely have to admit the truth: that AV is demonstrably the worst of all possible systems for the BNP, because voters can gang up against them, and don’t have to try to figure out which party is best-placed to beat them and vote tactically for that party. Ed Miliband, Caroline Lucas and Nick Clegg may even need to be ready to call Mr Cameron and Hague outright liars, if they go on pretending AV will electorally benefit the BNP. If, as the charges against him mount up, Hague eventually had to go, who should replace him? Surely the time is ripe for the coalition to start to consider moving beyond the usual suspects, and picking a figure of genuine weight not tainted by Hague’s prototypically-Conservative failings. The huge but also hopeful ongoing crisis that the world now faces, with revolutions in the Middle East and the possibility of an enduring war and humanitarian crisis in Libya – in which we should break with Britain’s sorry past and side with the free Libyan forces – brings to mind two names which would actually carry some international weight. I am talking about two senior figures who would be believable as more than just narrow interpreters of Britain’s ‘national interest’: Ming Campbell or Paddy Ashdown. re evacs, there is no can to carry. everyone got out safely? The answers to your questions are that Hague is not a neocon (or, its alter ego, a ‘liberal interventionist’, like Blair).Cameron is becoming a necon. The article is imbued with the idea that ‘we’ can liberate Arab masses, whereas the reality is the British, French and Americans will only make things worse, by seizing their oil and getting ‘them’ to pay for ‘our’ military intervention to achieve that. Thanks, Ahmed. But I think you are exactly mistaken. Hague is a neocon, in that he shares the central fascination with supporting Israel and he opposes homegrown democracy. You are fighting the last war – Iraq. the world has changed. Now it is democracy that is leading the way, from the bottom up. That’s why Hague has been caught out and left behind. Yes, and you share a fascination with banging on about Israel at every opportunity. I support Israel and was on miners’ picket lines when you were handing out Lib Dem leaflets. Hague is a foolish man for many reasons but leave the jews out of it. This is about Libya. If you don’t understand that there is an important connection between Israel’s fear of democracy spreading in the Middle East / North Africa and the poor response of the likes of Hague to the democratic uprisings, then you don’t understand anything important about the situation.